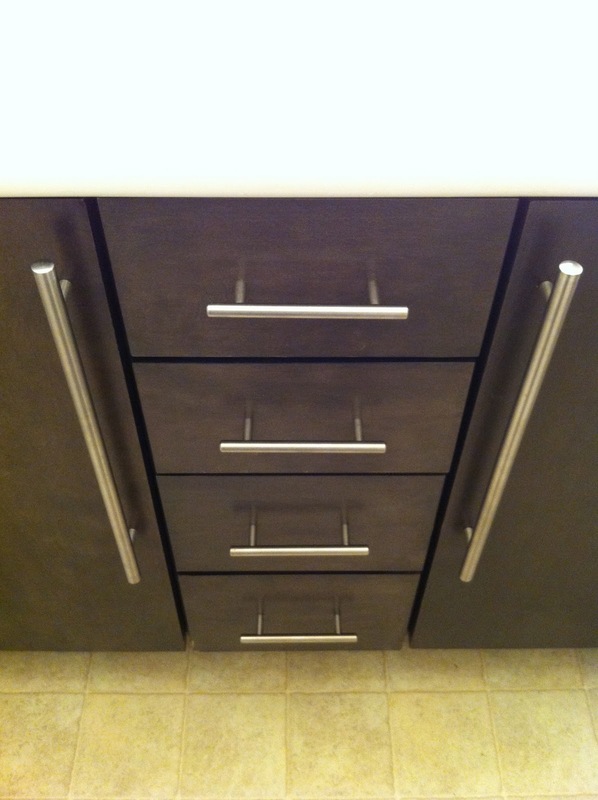 getting a handle on paint, cabinets | . stephrything . 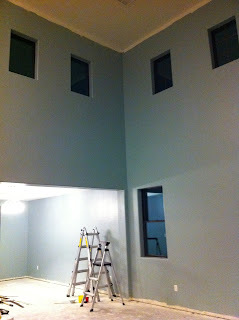 Spent these days painting more Frozen Pond in the front room and hallways. We had friends Jourdan and Greg help us, so the work went super fast. 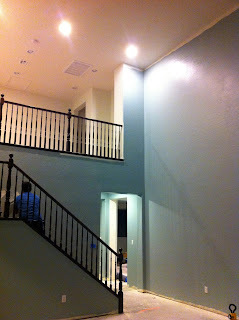 The 20-foot walls are something else. I also painted the family room with friend Sarah. We chose another Behr color: Contemplation. It coordinates with Frozen Pond but is a bit lighter and a hint greener. 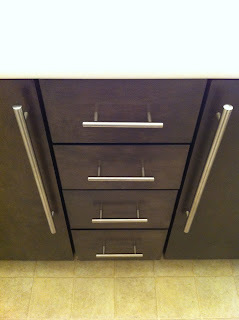 The company that manufactured our cabinets, Del Grosso, also installed our cabinet handles and moved our microwave cabinet. Our cabinets are by Cardell, Urbano II Maple in Smoke finish. And the cabinet is now here by the oven. Microwave will be installed soon. We carried the same handles (Ikea Lansa) throughout the house. I love how they turned out. Their employee, Jose Luis, did a fantastic job lining up the handles and making them look perfectly modern (easier said than done). Carpets 'N More surprised us with our laminate flooring, too! We weren't expecting it to arrive so quickly, but they pulled through for us. 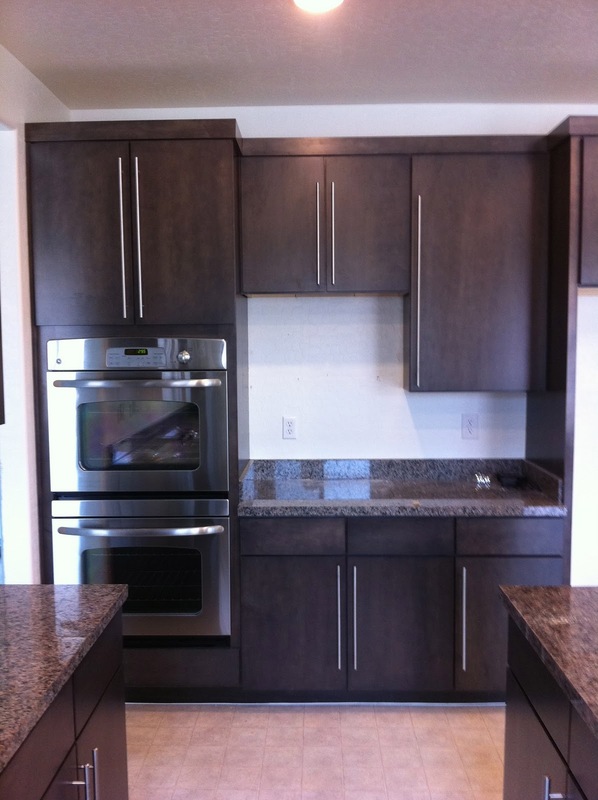 The laminate we chose is Scottsdale Zanzibar Gray. The hand-scraped planks are 5.5in wide and 12mm thick. For laminate, it looks really good and will hold up well for our toddler and future children.